Now Available: Guide to the recently released 2019 U.S. HTS Changes! David Gomez - CEO, World Exchange Inc. If your job depends on informed compliance, you need International Trade Today. 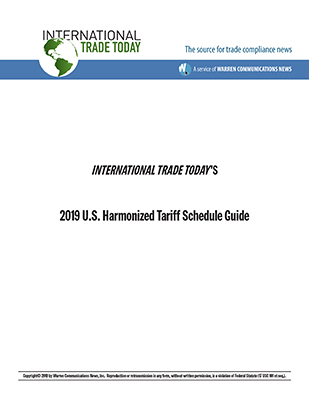 Delivered every business day and available any time online, only International Trade Today helps you stay current on the increasingly complex international trade regulatory environment. The White House announced on the evening of April 11 that it is nominating Nazak Nikakhtar, the current assistant secretary of Commerce for industry and analysis, to be under secretary of Commerce for industry and security. Kevin McAleenan assumed the role of acting secretary of the Department of Homeland Security on April 10, DHS said in an April 10 news release. On April 11, McAleenan said Transportation Security Administration (TSA) Administrator David Pekoske was designated "senior official performing the duties of the Department of Homeland Security (DHS) Deputy Secretary." DHS has not said who will take over for McAleenan as CBP commissioner. Michael Roberts, previously general counsel at Crowley Maritime Corp., was named the company's senior vice president for government relations, Crowley said in a news release. "The move will enhance the company’s presence in Washington to better address the important policy and regulatory issues affecting the maritime and logistics industry, and to increase support for the company’s fast-growing work on behalf of the federal government," the company said. Parker Harrison, previously senior vice president of procurement and risk management, will become general counsel, the company said.